Exciting things Happening at Natureworks! 19 Jul Exciting things Happening at Natureworks! When you think of summer, what flowers come to mind? Top of the list are hydrangeas. This week we are SO psyched to be hosting Lorraine Ballato, CT author and hydrangea expert. Her long awaited workshop Success with Hydrangeas is happening this Saturday morning from 10-11:30. The class is starting to fill up, so register today. Click Here to link directly to the online registration form. Which is which? 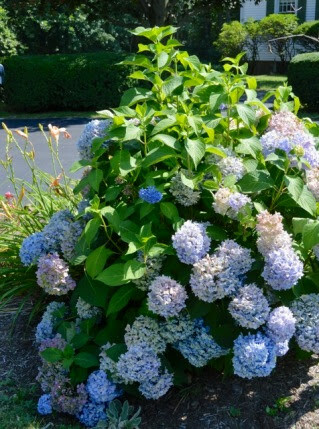 Are these macrophylla hydrangeas or another species? How would you prune them? Can they take full sun? Find out this Saturday at our Success with Hydrangeas workshop. Register today. For example, check out this photo of a blue hydrangea that I snapped in a parking lot. The new green growth is overtaking the flowers. Do you know how to prune it at this time of year for maximum bloom? 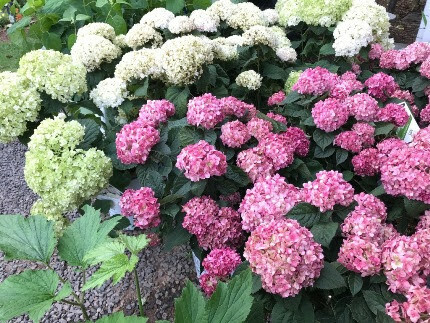 Why do some hydrangeas bloom reliably and not others? And what about all those new varieties, especially in the H. paniculata species? It’s getting very confusing. Some hydrangeas are tall, some are short. Some bloom on new wood, some bloom on old wood, some bloom on both. Let Lorraine help you sort it all out. We are totally in the swing of things and raising monarch butterflies like crazy. They are flying all over Natureworks and in our home gardens. We just received a fresh shipment of common milkweed, super-healthy young plants. We have also restocked many other varieties of Asclepias. 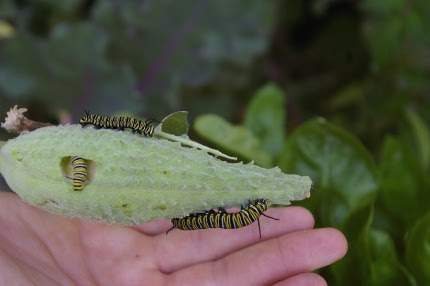 All provide the larval food plant for the monarch caterpillars. We spend a lot of time working with our customers to match them to the right species for the size and style of their yard. But one thing is for sure, if you plant it they WILL come. This Thursdayis another of Dianes’ training session on How to Raise Monarch Butterflies. Registration information can be found below. She keeps the class size small and participants go home with an egg or caterpillar to raise. If you are not sure you can come, call Thursday morning to see if there are any spots left. Amber just informed me that we have 14 eggs, 93 caterpillars, and 34 chrysalises right now in the shop. So far we have released 46 monarchs! Thank you Karen Gallagher for the hard work you do to keep our Kid’s Garden so beautiful. She did a major tuneup last week and it looks amazIng! 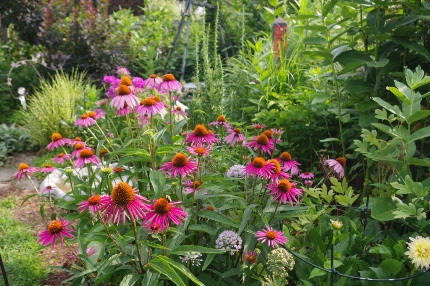 I don’t know about your gardens, but I spent a ton of time in the Natureworks shop gardens and in my home gardens doing a lot of deadheading, cutting back, weeding, and grooming. They seemed quite “shaggy” to me and in need of some love. I also “cut windows” in my borders- some shrubs were simply taking over the garden and it was time for a heavy handed chop chop! We are in a transition time as the May/June plants are done and the hot summer plants are just coming into their own. This Thursday evening on Facebook Live at 5 pm I will be talking about some of these Classic Summer Flowers and how to grow them. 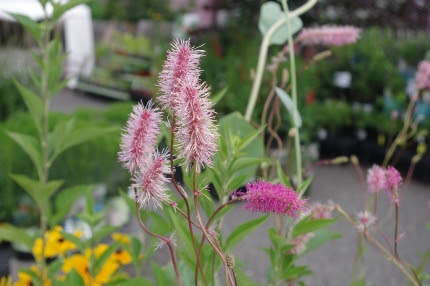 I adore this pink Sanguisorba (I have 3 in my home garden!). 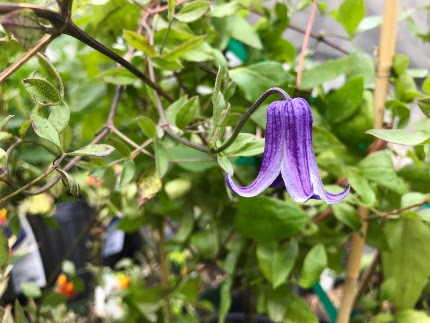 This is just one of the many unusual plants we are carrying right now. 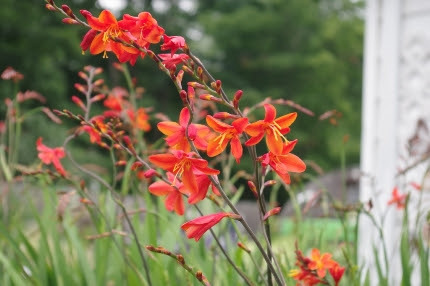 Add Crocosmia ‘Distant Planet’ to your garden to attract lots of hummingbirds. week as are the Crocosmias. 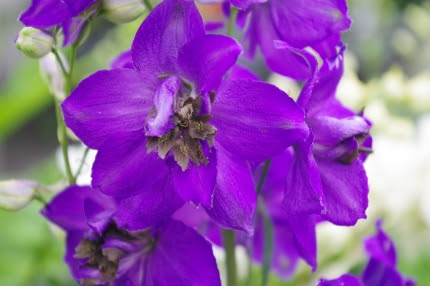 The delphiniums still look awesome and we have all kinds of great summer Phlox paniculata varieties in full bloom. It’s peak daylilly season and nothing says summer more than daylillies and hydrangeas in a perennial border. Diane has put the daylillies on sale for the next 2 weeks at 20% off AND has also put all the berry plants on sale- blueberries, strawberries, raspberries, blackberries, and FIGS. Let me tell you, I have been feasting on fresh picked raspberries and blueberries for a few weeks now. Plant now and within a few years, you too will be eating fruit from your garden. There truly is nothing like it. 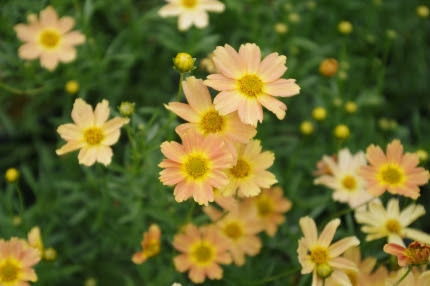 Summer blooming threadleaf Coreopsis are so easy to grow. This is an unusual color named ‘Sienna Sunset’. 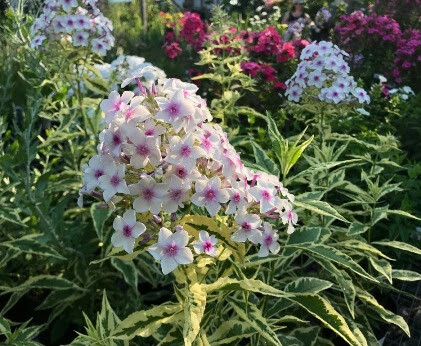 Variegated phlox looks great even when not in flower. My garlic “mandala”. 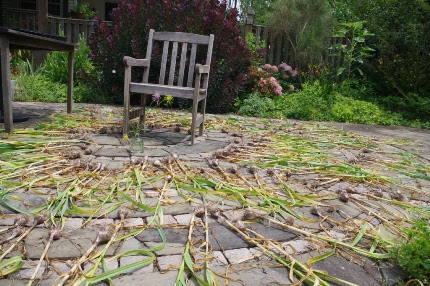 I laid all my garlic out to dry in my sunny courtyard on Sundayafternoon and then brought it into the back garage just before it rained. Harvest on Monday and continue to pound thick wooden stakes into the ground to hold up my massive tomato plants. I put up my cucumber beetle trap and it’s working great. Diane is having tons of trouble with flea beetles on her tomatoes and will be installing a flea beetle trap in her veg garden tomorrow. I also do a lot of handpicking and I scout morning and night to try and spot any signs of pests before it becomes a big problem. I fed my delphiniums with Pro Start and Coast of Maine Quoddy compost last week. I am hoping to get a good rebloom this fall. our client’s gardens. Some prefer to mix up liquid such as Neptune’s Harvest blends and water them in. I showed how to create our Summer Magic Formula of Pro Start and compost and add it to the base of roses, delphiniums, and butterfly bushes to keep them happy. I demonstrated how to blend up a liquid seaweed foliar feed spray. We talked about the various fertilizer formulas and why flowering plants need more phosphorus and foliage plants need more nitrogen. Click Here to read our Feeding the Garden handout which explains this in more detail. One pest that no one wants to run into in the yard are deer ticks. 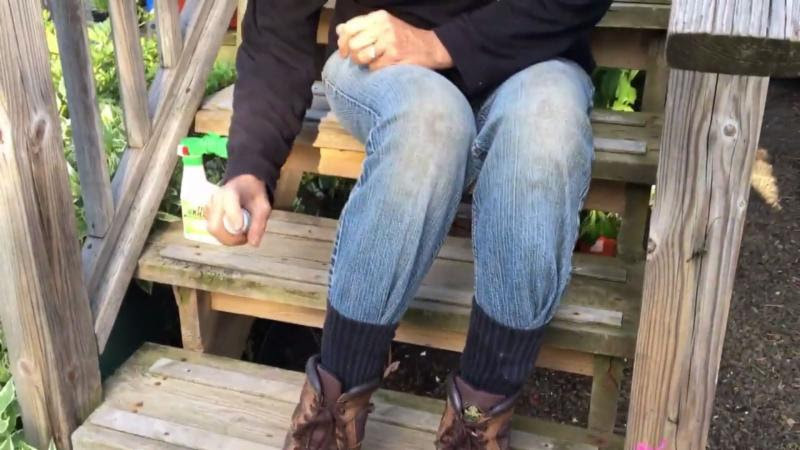 Tuck your pants into your socks, spray yourself with cedar spray, and spray the yard with Tick Killz. I always wear long pants when gardening, and if I am working in the wilder areas, I tuck my pants into my socks. The crew and I spray with cedar oil spray, the best all-natural repellent. We do have in stock Tick Killz, a hose end sprayer that contains cedar oil- use this to spray your yard, especially the wilder areas and around the edges. We have had great success with Tick Killz! Next week we are having our very first Herbal Tea Luncheon. Read all about it below and register with a friend. Sandy Merrill and I are cooking up some great herbal treats and it is a perfect opportunity to relax, eat, drink, and learn a lot about herbs. I can’t wait! A serene scene in our new shade garden. 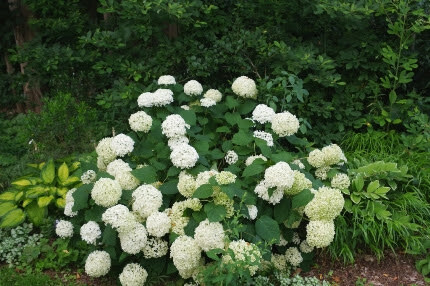 Can you name this hydrangea and do you know how and when to prune it? Success with Hydrangeas workshop is this Saturday! Sign up today! Enjoy this beautiful summer week, SO lush and abundant, overflowing with color and filled with life. 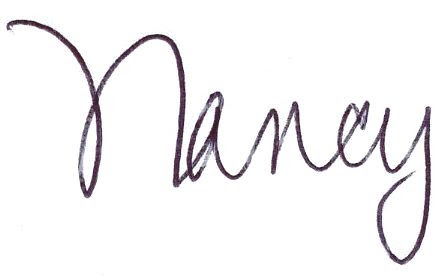 I hope to see you very soon!